10 years or one million gallons of the freshest & cleanest filtered water! The EQ-1000 features the same innovative upflow filtration design as our EQ-600 plus a larger 20 inch pre-filter and upgraded filtration media to protect your home from water contaminants and chemicals for up to 1,000,000 gallons (3.8 million litres!) or 10 years of continuous use. The Rhino whole house water system is regarded as the leading whole house water system on the market. Its 3 stage filtration process supplies better than bottled water quality throughout the entire household for only pennies a day! This means all the water used in your home can benefit from the purest possible water; the water you & your loved ones drink, shower and bathe in, the water you wash your clothes in, the EQ-1000 whole house water filter supplies healthy, filtered water to every faucet and water source in your house. It works as a point-of-entry system to reduce chlorine and chlorine-resistant parasites as soon as water enters a home’s plumbing system. 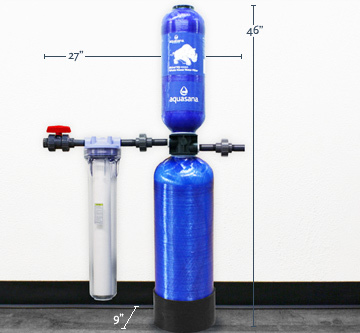 The EQ-1000 Rhino Whole House filter system is one of a very few whole house water filter systems certified by NSF International for contaminant reduction – the gold standard in water filtration. Aquasana Rhino is the right product for your family's water needs! Drink, shower, bathe, LIVE in pure, healthy water! Stage 1 - In the first stage, the upgraded 20" sediment pre-filter catches rust, sediment and silt. Stage 2 - Copper-Zinc & Crushed Mineral Stone - Water flows up through a bacteriostatic blend of a patented copper-zinc media and crushed mineral stone. This stage greatly reduces chlorine, water soluble heavy metals, and scale while also inhibiting the growth of bacteria and algae. Stage 3 - Activated Carbon Filter - Water flows through a high-grade, activated carbon filter reducing herbicides, pesticides and other chemical compounds that may be present in your water. Ideal for those connected to local town or municipal water supply! The EQ-1000 Premium is ideal for those connected to local town or municipal water supply. For those who source their water from Well or untreated water supplies the EQ-300-Well is the perfect solution, this can be further customised with a UV filter for the ultimate in water purity. *Download the Aquasana EQ 1000 Rhino Installation Manual (PDF)> *Please note the EQ-1000 unit for sale in the UK does not have the by-pass loop feature, shut-off valves, bend supports & brass “T” fittings as detailed in this PDF manual. The system is easy to install with the help of a licensed plumber and requires no electricity or back-flushing. It installs where your water line enters your home - typically where your hot water heater is located. It can be installed inside or outside your home, and needs only be protected from extreme temperatures or direct sunlight. The system comes with everything you need for installation. System maintenance is easy: just replace the two main filter tanks every 1,000,000 gallons /3.8 million litres (10 years for the average household), and you can replace them yourself without a plumber's assistance. Simply shut off the water at your system with the provided valve, detach your main tanks (bottom and top tanks), and replace them with the new EQ-1000R tanks. No messy, time-consuming, media-only replacements required. The process takes minutes. 1. Why are whole house water filters considered point of entry systems? — The filtration system is installed at the point where the main water supply enters the home, delivering filtered water to all subsequent outlets. 2. What is hard water? — Hard water contains a higher than average amount of dissolved minerals (primarily calcium and magnesium), and a higher concentration of multivalent cations (Ca2+ and Mg2+). 3. Does having hard water mean it is contaminated? — No, hard water is more of a nuisance than a health issue, and is not considered contaminated. Most water sources in the UK and Europe are considered hard. Is hard water safe to drink? — Yes, hard water is healthy enough to drink. 4. What is soft water? — Having soft water means you have a lower concentration of dissolved minerals and multivalent cations in your water. The most recognizable trait of "soft" water is how much more soap lathers, as opposed to hard water, in which soap lathers less. 5. Does having soft water mean it is clean water? — Soft water does not mean clean water. Your water can be soft and still have contaminants present in the water. Soft water simplly has a lower concentration of dissolved minerals and multivalent cations. Is it safe to drink? — Yes, soft water is considered potable as long as the water has not passed through a sodium-based water softener. Drinking water from a sodium-based softener increased your daily intake of sodium, which can lead to health problems in sodium-sensitive individuals. 6. What is a water softener? — A water softener is a system designed to remove/reduce calcium and magnesium from the water by exchanging it with sodium (or sometimes hydrogen or potassium). This is done through an ion exchange resin that alters the molecular structure of the calcium and magnesium from a divalent ion to a univalent ion, making the water "softer." Do softeners reduce chemical contamination? — Softeners do not remove chemical contamination themselves, but softeners sometimes have a carbon filter working in conjunction with the softener to treat contamination. 7. What type of filtration mediums do you use in the top tank of the EQ-1000? — The EQ-1000 top tank contains a KDF-55 medium (A mixture of 55% copper and 45% zinc mineral alloy) for the reduction of chlorine and certain heavy metals*, as well as a crushed mineral filter stone to enhance the water's pH and control scale* on internal plumbing. Both media are bacteriostatic*, which means they prohibit bacteria and algae from growing or developing within the system. 8. What is the difference between EQ-300 and EQ-1000? — Both systems address the removal of chlorine in municipal water. The EQ-300 is certified by NSF to reduce chlorine by 97% for 300,000 gallons. The EQ-1000 is certified by Pace Anayltics at NSF standards. The EQ-1000 has an additional 5 lbs of carbonized coconut shell in the top tank, plus 2 additional lbs of KDF-55. It also comes with a 10 year Warranty on the tanks. 9. What is KDF? — KDF stands for kinetic degradation fluxion, which is a redox filtration medium. KDF uses a unique combination of copper and zinc that creates an electrochemical reaction. During this reaction, electrons are transferred between molecules, creating new, harmless molecules and compounds. Free chlorine, for instance, is changed into benign, water-soluble chloride, which is then carried harmlessly through the water supply. Similarly, some heavy metals* such as copper*, lead*, mercury* and others, cling to the medium's surface, thus being effectively removed from the water supply. 10. What type of medium is used in the bottom tank of the EQ-1000? — The EQ-1000 bottom tank contains a carbonized coconut shell medium that reduces synthetic chemicals* and VOC's*. 11. What percentage of chlorine do Aquasana Whole Home Systems remove? And for how long? — The EQ-1000 is certified to NSF Standard 42 by an independent lab, Pace Analytic, for the reduction of >97% of chlorine for 1,000,000 gallons. 12. Does the EQ-1000 remove calcium? — No. The KDF medium in the top tank of these systems change the structure of calcium into a form of calcium called aragonite, which has trouble sticking to the inner walls of plumbing and therefore reduces the possibility of scale buildup in plumbing. 13. What is the flow rate of the EQ-1000? 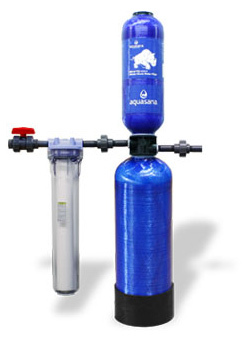 — All Aquasana Whole House Systems perform at approximately 7 gallons per minute (gpm). 14. Will I experience a drop in water pressure after installing the EQ-1000? — As long as your home is less than 3500 sq. ft. and you have 3-1/2 bathrooms or fewer, you should not experience any noticeable drops in pressure. If you have a larger home, we can build a custom system to deal with the typical water capacity of your home. 15. What is chloramine, and does the EQ-1000 remove it? — Chloramine is a disinfection agent used as an alternative to chlorine in some city water treatment facilities. They use chloramines for two big reasons: (1) chloramine is less reactive, so it does not create as many disinfection by-products as chlorine, and (2) chloramine is more persistent, and remains in the treated water through the distribution network all the way to the taps in the homes the treatment facility serves. The EQ-1000 is certified for the removal of chlorine, and the process of removing chlorine is similar in most respects to the process used to remove chloramine. The key difference is that chloramine exhausts the standard activated carbon in the bottom and top tank of the unit quickly, making the EQ-1000 a little less effective at removing it*. For customers with chloramine in their water, we have created a product with media that is more effective at addressing chloramines. The part number for this system upgrade is EQ-400, and it is available for purchase by calling the Aquasana Water Specialists at 866.662.6885. 16. Does the EQ-1000 remove bacteria or viruses? — No, if you are concerned about bacteria or viruses in your water supply, we recommend that you consider our ultraviolet light sanitation system. The ultraviolet light sanitation system uses ultra violet radiation to sanitize drinking water as it passes through the system, which changes the DNA structure of microbiological contaminants and some cysts. UV light radiation also prevents bacteria and viruses from reproducing, and microbiological contaminants cannot survive without constant reproduction. 17. Do I need a licensed plumber to install the EQ-1000? — Yes, it is necessary that you have a licensed plumber install the system for you, to ensure that the system is installed properly. Since most licensed plumbers carry insurance to cover any damages caused by an installation error, having a licensed plumber install the system for you will give you the security that the work was done properly and that the installation is backed up by the plumbing company's insurance plan. Not having the system installed by a licensed plumber will void the warranty of the EQ-1000.